Dali Decals : We also offer high quality custom canvases! We can make your canvas right from your own high resolution image, or you can select one of ours! Either way, our custom printed and stretched canvases will be a beautiful and vibrant addition to your space, and can be made in just about any size you like. Joe was kind enough to send me a e-gift card to choose a Dali Decal of my choosing. After awhile of searing I found the pink cherry blossom branches, I love pink and I love anything cherry blossom so as soon as I found this I knew i had to have them! My Dali Decals came perfectly wrapped in a long tunnel tube along with the yellow decal applier. My cherry blossom branches came exactly like they looked on the website (Love Them) I was expecting one branch but it came in (2's) so that was a great plus. And I was also given a cute 4 leaf clover Dali decal (Thank you Joe!) I also love anything Irish so that put a smile on my face. It was simple to use my Dali Decal. 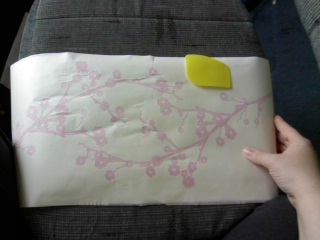 I cut around the paper, Peeled it off the sheet slowly while using the applier to smooth out the bubbles and It was done. I was amazed at how simple it was to use and how beautiful it made my lap top look. Now for the hard part, Figuring out where I want to put my second branch..Hmm.. Dali Decal has tons of amazing decals to choose from such as, Nursery, Tree's, Florals, Quotes, Shapes, Wedding, and tons and tons more! I was amazed at all the beautiful decals! Want a Dali Decal of your own?..Now you can! Joe is giving one of my readers a $25.00 e-Gift Certificate of their own! How amazing is that! Dali Decal has a Facebook page, Go "LIKE" them and send them some love! ♥ I receive no monetary compensation for this review. I was provided Decals to try and give my honest opinion. Like Dali Decal on Facebook on posted on their wall. Aw :( I tried reviewing his products and they were full -- too many reviewers! They all look awesome. Would most definitely invest in the "Be the Change" decal. Recently got the large cherry blossom branches for my living room and the "Dare to be remarkable" decals. LOVE THEM!!!! And that quote along with the change quote remind my children and friends to make a difference and follow your own path. 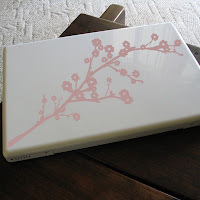 I'd `definately have to have the pink cherry blossoms! I would get the Victorian Flowers - Personalized Monogram - Wall Decals! Like then on FB and left a comment on their wall!